Finding My Japan. : Itabashi Firework Big Meet. That is the rough translation of the name of the event. After hauling home from my race (see previous post) I got home, threw my self in shower, got dressed, and left, all in about 7 minutes. WE rushed off to the station and waited in line for a bus to the event for about 25 minutes. We rode the bus for a long time, and then walked a long ways, and sat on hard conrete steps and watched big fireworks. According to my host dad, there were 3000 explosions! I would say that they were more than 100,000 people on both sides of the river watching this event. That day (8/5) is a really big firework day in Kantou. 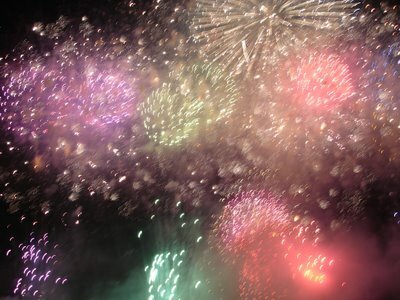 In the 6 prefectures, there are 37 large firework festivals! It was just like fireworks in teh states, but bigger than in Portland. Speaking of Japanese things larger and Americans, I saw this thing on TV about the longest hotdog ever made. Like, 4 or 5 days ago, the Japanese made the longest hotdog, which was nearly twice as along as the longest made by americans. The Japanese hotdog was 60 meters long!! The longest American one is 31. Oh well, I dont like hotdogs much anyway.